Yellow Tough Grid manufacture Super Grain Farms suitable for grain growing enterprises where anticipated usage is stockfloats, semi-trailer grain trucks, bogie-drive fuel tankers, large tractors and wide implements, plus a safety margin for excess loading and unsupervised locations. 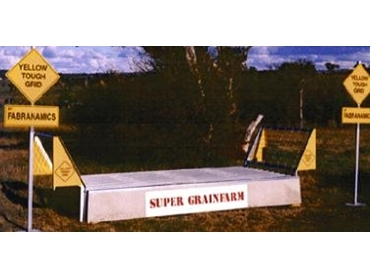 The super grain farms will be typically used in entrances to cotton gin yards, grain storage facilities, piggeries and dairy farms. Grids can be combined together using a joiner to form 8.0 metre or 12.0 metre grids. Reinforced concrete base with cast in protection channels on leading edges, cast in anchor points. Provision made in concrete base for cross road drainage. Mesh sides fabricated from pre-galvanised RHS with stiffners welded in across support members to stop sheep walking on these support members, bolt onto the end bars of the grid. The Rectangular Hollow Section rails are galvanised for long life. Additional elements: safety fencing: bright coloured site plates on grid approaches with posts for convenient connection of fence line.